Discussion in 'ORFFU' started by JPK, Oct 29, 2018. Match highlights Neale 140 for Gisborne and AMT 143 for Hughenden. Low light is Ward 4 with an ACL. For Blanchetown they have Steele, Walsh, Holman, Silvani & Dunstan. Groote will bring out Cripps & Weitering. Its still anyone's game, and may well be decided on Jaeger turning up and whether the umps treat Sicily like a player or a target! Full Time at The Stadium. In a match lacking larges doses of skill and application, where only 3 players managed to hit the magical 100 pts, Serengeti have walked out winners by 32, scoring 1149 to 1117. There's not much else to say except that leading Buffaloes, Merrett 155 and Kelly 114 put the Barcrawlers to the sword during the 2nd term, and only Suckling 107, in defence for Banchang, played anywhere near his best. When the BIG TAP is won by 38-35, that in itself, says it all. Serengeti now go home with 2 wins 2 losses ready to face Nuytsland in RD5 while the Barcrawlers 3-1, are at home to the ever improving Cow Bay. Lobbe SB def Sinclair BB 38-35. Out at The Swamp the Crocs have continued their great start to 2019 with a 301 point win over the Smugglers with a score of 1,236 to 935 at the final siren (pending audit by the ORFFU scoreboard commission). Although Hurn took BOG honours, unfortunately the visitors 3 had players fail to find their way to Cow Bay with Kreuzer, Beams and Geary all missing the game. 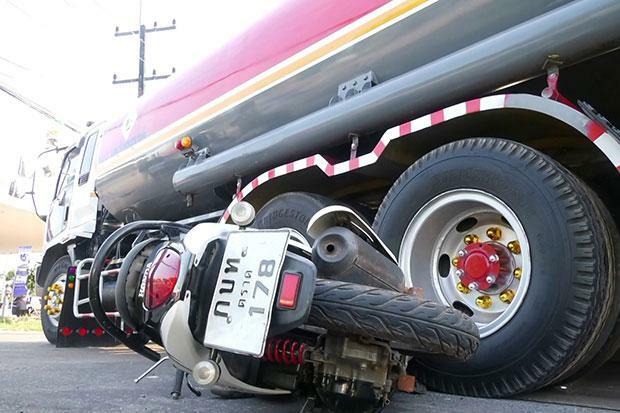 GENERAL -Forty-six people killed and 482 injured in road accidents across the country on the first day of the "seven dangerous days" of Songkran holiday travel. And this is a big reason why there are so many deaths on Thai roads at this time of the year.....Below is for 3 days 11-13th April, 2019. Looks like the home fans got ahead of themselves, with news filtering through that Jaeger wouldn't be taking the field, then everything came crashing down as the visiting Monarchs @Tylo took a 13 point win in the Goldfields. Full match report to come. A record attendance over the weekend out at The Swamp witnessed a 301 point defeat of the 12 man Smugglers. It was a bitter sweet victory. Defeating an opponent when their down gives you 4 points, a feeling of woo!, but not the usual elation. However, it's now 4 on the trot for the Crocs, very unfamiliar territory for the coach and the team. What's even stranger is that the ladder is no joke. The Crocs are on top?! There's no one yelling out "upside down upside down" so I guess it must be real. After being buried in the bottom quarter of the ladder for so long it's still hard to believe the change in the team's fortunes over one preseason. Lycett (83) dominated in the ruck. Well he should have with Kreuzer deciding to visit the markets 2 hours south of Cow Bay in Kuranda rather than suit up for this week's game. The trinkets he brought back for teammates were rightly thrown back in his face. Taranto (113) led the mids who all contributed strongly. Libba (106) was sorely missed last year and Hopper (106) continues to repay the faith in having the first pick of the draft invested in him a few years back. Down back Witherden (92) was the standout with decent support from Jones (80). Despite the strong win, Cow Bay's forwards let the team down. Gunston (58) has hit a rough patch with De Goey (85) the only forward getting out of 1st gear for the homeside. With first year player Clark (53) probably starting to tire from the rigours of senior level ORFFU football, Acres (105) announced his return to the senior side with a much missed performance. With no ruckman, Beams and Geary decided they didn't want to listen to the taunts of the home side and headed down to Port Douglas, checked in to the Sheraton Grand Mirage, and spent the weekend sipping cocktails by the pool. Heppell (76), Hall (73), and Smith (55) struggled with the weight of 5 men on their shoulders and fought hard to provide some drive. Hurn (139) and Simpson (107) were two of the better performed in the team with the ball having spent a considerable amount in their half of the ground. Although the forwards failed to fire much of a shot, JJK (76) and Gray (72) tried to do something but it was youngster Hunt (110) who provided some spark for the visitors. The win moves Cow Bay to first place with a 4-0 record whereas Christmas Island slipped from 13th to 14th with a 1-3 record. Next week Cow Bay travels to the presently chaotic Banchang. The team will be taking every bit of travel advice onboard from Coach Choppers who themselves will be seeking a win to keep pace with the top 8. Christmas Island head back home to host the Sandgropers, a deceptively tough opponent who are likely to be without Fyfe. Cheers Fresh - a new low for the Smugglers with our lowest ever FU score! 2019 could be a long one at this rate. @YAD69 Thanks for the update over the weekend. I am about the worst ever at doing it, sorry to everyone. This weekend the struggling Bunyips hosted the mighty Barracuda's at Blanchetown. Whilst at the start of the contest there was a glimmer of hope with the potential of a full side running out it just wasn't to be. Silvangi, Dunstan and Tyson all decided to head out for a midweek feed at he local Chinese restaurant (who are not well known for their high standards in hygiene) and subsequently all came down with the shits. Which is about how I am feeling about our 2019 campaign. Whilst there were a few glimmers of hope for the home side Walsh (123), Holman (82) and O'Brien (84) for the long term plans of the Bunyips, it was the super stars of the Cudas that did all the damage. Led by Capt Cripps (169) the Bont (127) Phillips (116) Lloyd (109) and Tomahawk (111) the visitors were in cruise mode. Even Weitering ran around and did whatever he liked for a handy 105! Is it possible to tag Cripps? It would seem an unlikely task for anyone at this stage and the Cuda's are hoping not as they are at home this week against the Bulls and vying for a top 4 spot whilst we are at home again against the Panthers. @martyg we were wondering what the stains were down Egerton St.
Once you guys get a full squad on the field things will start happening however it's a tough start to the season. Haha... good local reference there mate! Bring on the MSD is all I can say! Hughenden were blown away (up!) in the end by a powerful Grenade unit of consistency at the Dino Dome leaving the home fans asking a lot of questions about the coach’s off season recruiting efforts. The lack of a playing ruck and with Ward (4) playing his first game of the season only to succumb to an ACL and McKenzie (39) concussed in the second quarter just piled on the misery for the home fans. Take nothing away from Gisbourne who had winners all over the ground Neale (140) Billings (126), Laird (106) and Pittard (109) being the outstanding performers with Witts (107) easily outpointing Rayner (10) in the ruck. The only highlight for Hughenden was AMT (143) who was unstoppable in the forward line with only Shepard (109), Shiel (115) and Yeo (114) showing any resistance. The rest of the Hughenden players were well below par. The Grenades are already looking like finals material with a stable team and consistency being the key to success. Hughenden is now battling it out for bottom of the table and a long season ahead. The Grenades are back home this week to take on the Prospectors and Hughenden are on the road taking on the winless Whalers. The introduction of the 6-6-6 rule finally paid dividends as a free flowing shootout occurred at Mill Park. For the Blowflies Mundy was BOG with 151, Redded grabbed the 2 votes with 145 whilst Ablett & Walters tonned up. In the Big Tap Goldstein accounted for McEvoy. In the end this game could have gone either way but both coaches will go away happy with the performances of their respective mobs. The Blowflies slip to 1 & 3 however repeat performances like this one will see them win more than they lose. The Bulls move to 3 & 1 and have rediscovered their scoring flair which has been absent for the past few seasons in a welcome sign to Bulls HQ. Great report, thanks mate. More players on the park for the whole day and who knows how it could've turned out. I enjoy the count, would like to see it back. The more contributions to FU the better I say. @Tomster yep, would like to see the return of the count.